She's a defensive hybrid support with ties to Torbjörn and Reinhardt. The 27th Overwatch hero has been officially revealed, and it’s Brigitte. She might be Torbjörn’s daughter and Reinhardt’s squire, borrowing from their movesets, but she’ll fill an important role on teams. After a week of data leaks and teases, Blizzard formally announced Brigitte and released her to the test servers on Wednesday. With that came full details that confirm how she’ll fit into Overwatch’s growing lineup of heroes. 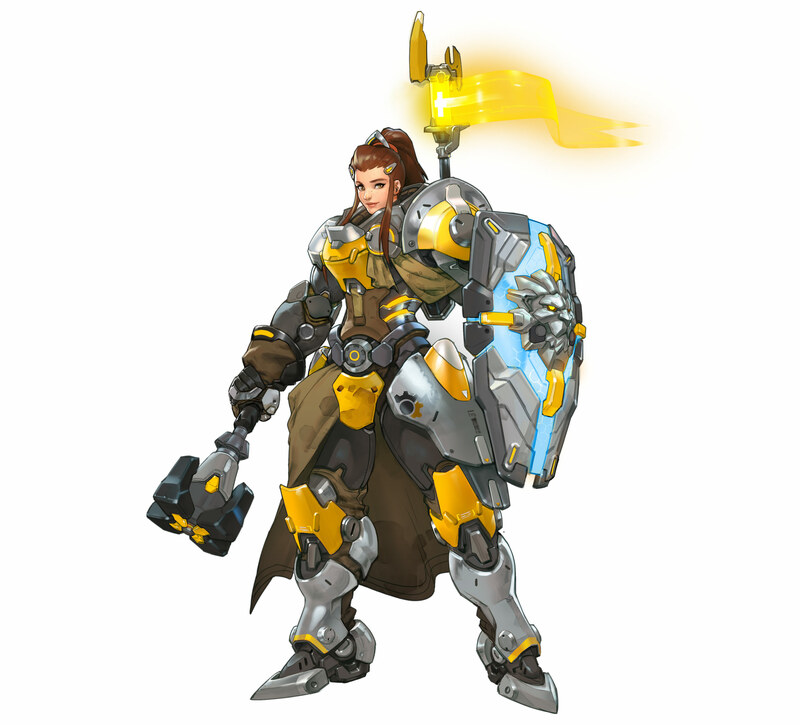 She lands somewhere between Defense and Support with a bit of Tank mixed in, and her story also contextualizes what we know about Torbjörn and Reinhardt. Since Overwatch’s release, Blizzard has debuted four new heroes: two Support, one Tank, and one Offense. Brigitte’s official designation is Support+, but much like Symmetra, she’s closer to a Defense character than she is to more traditional healers like Mercy or Ana. Game director Jeff Kaplan says she’s “primarily Support” but she’s definitely a Support-Defense-Tank hybrid with a moveset that mixes Reinhardt, Torbjörn, and Doomfist. Brigitte is a kind of frontline brawler with Defense and Support perks. We’ve met Brigitte before in the Reinhardt animated short video “Honor and Glory” and before that in the Overwatch comic “Fighting Dragons.” She grew up in her father Torbjörn’s workshop as he built weapons for Overwatch, becoming a tinkerer herself. She also spent years as Reinhardt’s squire, fixing his weapons and armor before suiting up herself. But now, she’s entering the fray as a brawler that simultaneously supports her teammates. But she also gets a personal shield much smaller but similar to Reinhardt’s that can Bash enemies in a rush that stuns them. She can also toss Repair Packs superior to Torbjörn’s because they can heal and provide extra Armor. Brigitte’s Ultimate ability, Rally, increases her movement speed and provides Armor for nearby allies that only dissipates when they take damage. Brigitte might be a real game-changer. Like almost every other post-release character addition to the game, Brigitte might not be able to solo any roles in a team’s roster. Because she’s such a hybrid, she probably won’t be able to solo-heal a team or even tank by herself. Her moves might resemble that of Torbjörn and Reinhardt, but she’ll play totally different from them. Those two are often best played defensively, with Torbjörn delivering suppressive fire and protecting his turret and Reinhardt shielding the team from enemy damage. Brigitte will have to rush through and beyond Reinhardt’s shield with a more reckless and chaotic playstyle. Fans of Moira and Doomfist might feel right at home in Brigitte’s shoes. It’s all too fitting that Brigitte will probably work really well in-game with Torbjörn and Reinhardt, especially if the team was defending. They’d get ample healing, armor, and shields with three heroes to spare. Brigitte might also work really well with Doomfist, fighting together on the front lines and giving him even more of a fighting chance in Competitive play. Much like Doomfist, Brigitte will also probably benefit a great deal from Zarya’s Projected Barrier. In fact, we’d love to see what a team with Brigitte, Doomfist, Reinhardt, Torbjörn, Zarya, and Zenyatta could do in any match. Brigitte is currently only available on the PC public test region, and she’ll likely be released on consoles sometime in the coming weeks.